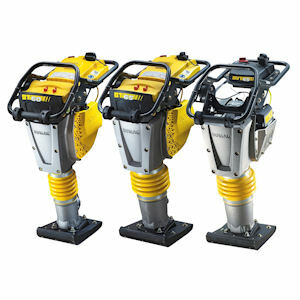 BOMAG’s new line of vibratory tampers includes a wide range of models that allows users to select a machine that best suits the requirements of a given job. The tampers combine low operating weights with compaction performance to optimize both productivity and ease of operation in applications such as trench construction, utility and cable backfill compaction, landscaping, and small repair jobs. Boasting the highest power in their respective weight classes, the BT60 weighs 128 lbs. and delivers up to 3,372 lbs. of impact force, while the BT65 weighs 150 lbs. and produces 3,822 lbs. of impact force. The BVT65 weighs 143 lbs. and delivers 3,597 lbs. of impact force. Each model is powered by a 4-cycle Honda engine with recoil starter, and offers a maximum travel speed of 66 ft. per minute.